Francis Chaming, 15 Sep 2013I will be impressed if Z1 has a stylus pen otherwise P1 is still the best business smart phone... morethere is the xperia z ultra that can use any pencil as stylus. I've seen this for myself. The display is not as good as what GSMArena are saying. The colours are still washed out, much its predecessor Xperia Z. Anonymous, 16 Sep 2013From the start when the Z1 was first revealed at IFA and still now, the camera's picture quali... moreReally? Im not a sony fanboy, and goodness not a sammy fanboy too. But, S4 vs Z1 and S4 wins? U really have to get your eyes checked. And please don't tell me u just compare them with 8mp superior auto from Z1. From the start when the Z1 was first revealed at IFA and still now, the camera's picture quality is an issue which has not been solved. You'd expect better quality stills from the Exmor hardware. The SAmsung S4 camera, despite its lower res. blows the Z1 away. The note 3's camera should be as good or better than the S4's. Also, the note 3 does hd audio at 24bit 192k, an industrywide first(not even the latest iphone can do this--it just downsamples high resolution audio files). The specs on sound quality remains to be seen on the Z1 and note 3.But if the S4's near perfect sound quality is a precedent then the note 3, in terms of features, will be the top phone out there for now. I can't wait for GSM arena to do their "closer look preview/hand on"
Anonymous, 16 Sep 2013Yeah those you say picture taken from note2 on night condition? But clearly we can see the sha... moreCheck the three links. There is a photo of a wide landscape of a River with a distant hotel. What do you want with a night photo .... to picture a dark room !! Jati Royat, 16 Sep 2013You are truly samsung fanboy.. Why don't you try looking other brands flagship and compares it... moreI am not bas.hi.ng z1 ...u hav 2 let ppl share THERE openion rather than calling someone a fan.boy...u sud come up with valid argument ..u dont own gsma kid. AnonD-176622, 16 Sep 2013 The logo is behind the glass, and the glass is Dragontrail, a japanese special glass manufac... moreI hope so, because Xperia z has its SONY logo behind the anti shatter film protector. It would be so sweet if its Dragontrail glass, but i hope they include it in their specs sheet. 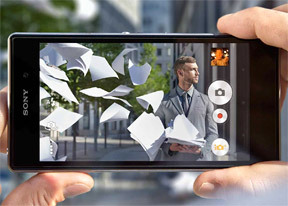 Xperia™ Z1 - the best of Sony is now even better. AnonD-22824, 16 Sep 2013I wud say if u can't wait get the note3 and if u can wait then go for s5 and if u can wait a l... moreYou are truly samsung fanboy.. Why don't you try looking other brands flagship and compares its strength rather than you keep banishing brands besides samsung..
AnonD-22824, 14 Sep 2013I have note2 and the camera on it even beats 13 mp xz and have u ever used note2 low light mo... moreReally? My wife use note 2, so i know the photos quality that could not be better than my ZL.. Wait for the Z1 released officially to the store first, and then you compare it with your own eyes with your note 2.. Until then, stop bashing other brands..
AnonD-183156, 16 Sep 2013Is the SONY logo behind the glass or behind the screen protector? O.o? What glass is Z1 made of? The logo is behind the glass, and the glass is Dragontrail, a japanese special glass manufacturer, the same glass used in the "SE xperia active".